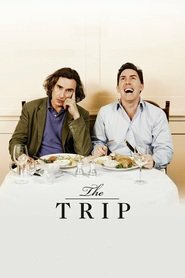 Living… in Strawberry Hill, in London, but he’s currently set off on a trip through Northern England with his buddy Steve Coogan. Rob’s status as a settled family man makes his view of the trip decidedly different from Steve’s. While Steve sees the English countryside as a stage for possible romantic dalliances, Rob is more content to enjoy it on its own terms and celebrate it as a brief respite from a generally happy home life. Profession… actor, presenter, and host of The Rob Brydon Show, a late-night talk show on BBC Two. Rob is a successful television personality in England, but he’s less well-known in America, at least less well-known than Steve. Steve rarely goes a day without reminding Rob of this. Yet, Rob seems more comfortable and content with his career than Steve, which adds another layer to their appealing dynamic. Interests… whatever strikes his fancy at the particular moment. In the course of the trip, Rob freely waxes poetic on anything from Alanis Morissette to the casting of the latest Batman films to Italian Renaissance history. But nothing gets him going more than impressions, particularly perfecting his Michael Caine impression – and proving that it’s better than Steve’s. Relationship Status… happily married with two sons. Rob’s marriage is alternately a source of envy and pity for Steve, whose own love life is currently up in the air. What bothers Steve most is that Rob is not even tempted to stray, that it never seems to cross his mind. Rob can admire a woman from afar and move on, while Steve’s gaze can’t help but linger. Challenge… making it through the trip without letting Steve ruffle his feathers. Steve never forgets to remind Rob of his status as second fiddle on Steve’s trip. Even in inviting him, Steve was clear that he was only calling Rob because he’d already asked other people and they were all too busy. It’s not that Rob doesn’t want a bigger career or fame in America, it’s that he doesn’t want to be consumed by it the way Steve is. Personality… comfortable, spontaneous, and charming. Rob takes himself less seriously than Steve, which essentially allows for him to have a better time on the trip. He is a master conversationalist, capable of insights, puns, and digressions – all within the same minute. He sees great importance in little things; his Michael Caine impression legitimately means a great deal to him. He’s less snarky and more lovable – the McCartney to Coogan’s Lennon. Rob Brydon's popularity ranking on CharacTour is #3979 out of 5,000+ characters. See our top-ranked characters and read their profiles.